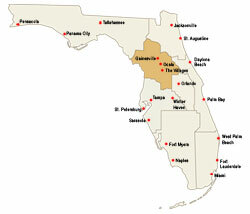 The North Central Florida region includes much of the state's Nature Coast and the area known as the Heart of Florida. From the rolling, rural settings of Ocala and Marion County to the rapidly-growing Orlando suburban area around Clermont and southern Lake County, the region offers a wide variety of experiences for both winter and year-around residents. Interstate 75 and the Florida Turnpike both run through the heart of the region, providing for rapid access to three of the state's largest metropolitan areas - Jacksonville, Orlando and Tampa. But a little distance can be a good thing: The area is home to over 70 golf courses, a major National Forest and a number of state parks, recreational areas and wildlife management areas. Welcome to Legacy of Leesburg, a premier Florida retirement community, where you will find the Florida retirement home of your dreams nestled in the best small town community! This Florida retirement community can be found in Central Florida’s lakes & hills region in a small town setting about 45 minutes northwest of Orlando. Fast becoming one of the premier Florida retirement communities, Legacy features a nature theme with stunning tracts of undeveloped land, many conservation home sites, beautiful lakes, ancient oaks, and almost seven miles of nature trails bordering conservation areas and an unspoiled stretch of the Palatlakaha River – Legacy is truly unique! The centerpiece of this gated Florida retirement community is the Town Center. This complex of buildings is home to the 35 foot Clock Tower, an on-site activities director, and the full host of amenities, trips and functions you would expect from only the finest retirement communities. Plus, Legacy is close to shopping and the city of Leesburg where there is an historic downtown district and plenty of events to suit a wide variety of tastes. Visit Retire2Fla.com's new information page for "The Villages" located in Central Florida. Here you will find information and pictures regarding one of the most sought after pieces of retirement real estate out there. Your feedback has told us that you are interested in "The Villages". Please check out our new Villages page and see and hear what you have been missing! We've designed The Villages community with your enjoyment, security and convenience in mind. By utilizing the latest concepts in neighborhood and community planning, The Villages community has been able to better serve its residents' needs without sacrificing its small town charm and intimacy. Virtually every convenience our residents need on a day-to-day basis can be found in the communities at The Villages and all are a golf car ride away. The communities at The Villages are an active 55+ adult community.